Students offer 1, 2, 3, 4 and 5 bed rooms with bunk beds and single. for convenience - kettle and fridge. Each floor has a communal open-plan kitchen. The buildings are safe - are protected. They are equipped with fire alarms and fire extinguishers. You can enjoy the grounds and play ball in the nearby schools. 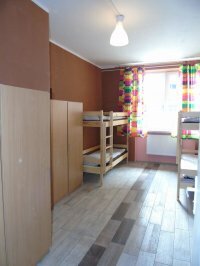 The dorm is inhabited by international students for the whole world. This gives a unique opportunity to have practice with polish language and establish an interesting relationship with people living around.